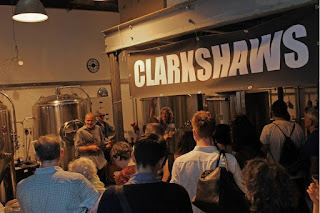 Clarkshaw's Brewery from Brixton is popping up for a week at the Platform Space in Loughborough Junction, SW9 from Tuesday 26th - Sunday 31st Janaury. Expect lots of their own beers on tap, inc the Cowgirl American Pale Ale, Gorgons Alive and more, plus special nights like a jazz band on Tuesday, a quiz on Thursday, and a party night on Saturday. It's going to be great! "Clarkshaws Brewery is hosting a week long residency at the Platform Space SW9 from Tuesday 26th- Sunday 31st January where we will be running a brewery taproom and shop, as well as hosting live music, parties and even a pub quiz. Exclusively available beers will include Clarkshaws’ Cowgirl American Pale Ale, White Out Session IPA and Archer Wheat Beer, alongside our full range of craft beers. Launching the week, About Blue, a Camberwell based jazz and blues trio, will be playing on Tuesday evening, bringing you vintage sounds from the great American songbook, from the Blue Note to Broadway. Led by the smoky vocals of Anna Ukairo, this guitar and bass driven trio play swing, ballads, blues and Bossa Nova – timeless classics from the golden age of jazz. On Thursday 28th you can play the first ever Clarkshaws pub quiz, run by hosts Pete Hanslip and Andrew Mizner. Teams of up to 4 can compete for beery prizes and cash, including the chance to be a brewer for a day. Saturday night will be our Beat the January Blues party. Join us to celebrate the end of the most miserable month of the year! To finish the week, we’ll be bringing back our Beer & Boardgames session on Sunday afternoon. There will be a £5 table fee that covers an unlimited number of players. First come first served! Bring your own game or borrow one of ours. Games available include everything from family favourites like Monopoly and Go For Broke, modern classics such as Carcassone and Pandemic, to advanced cult games including Seven Wonders and Game of Thrones."